Fast Five: My Favorite Face Masks | ya, we're basic. This is a bit of a different Fast Five because you guys have asked me about my face masks so many times and I seriously just realized I haven’t rounded them ALL up in one post. Here’s the thing: my skin can change week-over-week and with the seasons so I do have a variety of masks that I rotate and can legitimately say are tried and true. I typically do a mask at least 2x per week – and I may use the clay masque from SkinCeuticals (linked below) more than once as a spot treatment if I am getting one of my sweet, sweet hormonal breakouts. Definitely a mask day. After the weekend, especially if it’s busy, I will do a hydrating mask or skin balancing mask. Tuesday is a gentle exfoliate day. If I’m having a bad breakout week, I’ll spot treatment with SkinCeuticals clay masque before spot treating with topical things. On Wednesday’s we wear red. But really I just do a skin balancing mask and turns my face bright red so I highly recommend doing it before bed and not before an outing and promise you’ll wake up to baby smooth skin. YAY. I’m likely out at night so I won’t do a mask but if I am staying in, babysitting my pimples, then I’ll do a full deep pore cleansing mask with the Indian Healing Clay mask or my charcoal foaming mask. No mask but WASH YOUR FACE IF YOU’RE DRINKING GF! Do not want to wake up with bronzer schmeared on your pillow! And now for the masks. Here are my five favorites and what they do and why. Most are easy to find or order online with minimal shipping. Bonus! This is a great mask when my skin is in good condition. Use it as maintenance and for an extra glow when I am prepping to go out on the weekend. Leaves your skin really red so only do it at night. My go-to when I’m having hormonal breakouts. Really good to calm my skin when it’s oily. Can be drying so sometimes I only use as a spot treatment mask on breakouts. Insanely hydrating – keep this mask on overnight. Love this during seasonal changes when my skin dries out. Try to exfoliate and then apply this mask for ultra results. Use this when I want an overall renewal to my skin but can be hard to get off if you leave it for too long FYI. Helps with breakouts but also you can feel it working deep so I believe it’s preventative also. This one leaves your skin red too, so don’t plan on leaving the house for a few hours. This mask is just fun to do and it gives you a good overall skin surface. Love removing this mask because it doesn’t dry out so it’s easy to get off. There’s a tingling sensation which leaves your skin really plump and glowy. 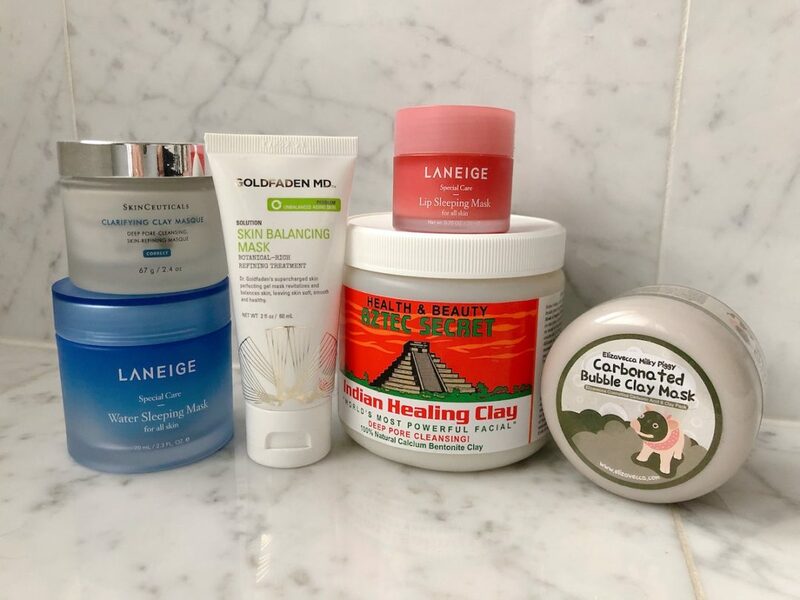 Honorable mention for this LANEIGE Lip Sleeping Mask which is a nightly special care lip mask that I recently purchased and I am fully on board and obsessed with. Definitely need this for the winter months. It is so good! Ok now you tell me: what are your favorite masks? I need to know what I should be trying.